Trending: Are performance reviews a thing of the past? When you hear the word evaluation what comes to mind? For most of us — whether we think about being the evaluator or the evaluated — it’s not good. That’s one reason that many organizations in the private sector are doing away with them. What?? In the education world, whenever you hear teachers cry out against evaluation systems you hear opponents criticize them as “anti-accountability,” Whenever school leaders cry out against their role as evaluators, they run the risk of being seen as lazy or unwilling to make the tough decisions that kids deserve. But Culbert notes that traditional evaluation systems — annual performance reviews — are hated by employees and their bosses across all sectors for valid reasons. 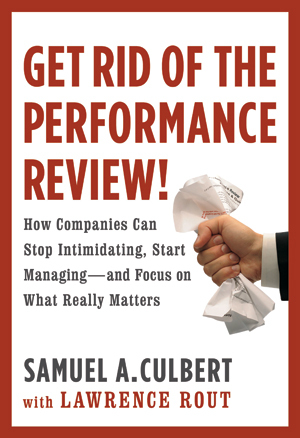 Culbert notes that performance reviews do more damage than good; rather than create a space for honest conversation about what’s working and what needs to improve, the review pits the evaluator against the employee and usually wastes the time of both in a conversation that avoids, rather than solves, the real problems. It also prevents managers from giving feedback to employees on a more regular basis — when it might actually improve performance. Instead of addressing a problem early and helping an employee improve, managers file pieces of data and feedback away to be shared in one big lump during evaluation time. And evaluation time is when an employee is most on guard and least likely to respond well to suggestions for growth. Instead of learning from the feedback, employees feel the need to defend themselves and their work in this high-stakes environment. “Don’t get me wrong: Reviewing performance is good; it should happen every day. But employees need evaluations they can believe, not the fraudulent ones they receive. They need evaluations that are dictated by need, not a date on the calendar. They need evaluations that make them strive to improve, not pretend they are perfect. “Performance reviews instill feelings of being dominated. They send employees the message that the boss’s opinion of their performance is the key determinant of pay, assignment, and career progress. And while that opinion pretends to be objective, it is no such thing. The overriding message is that the boss’s assessment is really about whether the boss “likes” you, whether he or she feels “comfortable” with you. None of this is good for the company unless the boss is some kind of savant genius and reads the employee with laser accuracy in understanding that person’s inner talents and personal priorities to accurately choreograph his or her efforts. Unlikely. What does all of this mean for education? As new evaluation tools are unleashed on school leaders and teachers, we must be aware of the power dynamics they create and how these dynamics stand in the way of real leadership and improvement. As leaders, we need to be savvy enough not to fall into the traps that Culbert draws our attention to, even while we cannot always control the evaluation systems we are charged with implementing. As teachers, we need to demand real feedback and honest conversations about our growth more regularly. And all of us need to push back a bit against performance review protocols that stand in the way of performance. Next postThrowback Tuesday: Are you surviving or thriving?